Most of this was on farms owned by families or family scale entities, known officially as non-industrial enterprises. Industrial estates, in contrast, are forests owned or managed by larger forest management companies. The amount of non-industrial private forest burnt as of yesterday was 31,071 ha, dwarfing the non-industrial hardwood plantations burnt total of 483 ha. On the industrial front, the private native forest estate burnt was 4254 ha, while industrial hardwood plantation area burnt was 2756 ha and softwood 533 ha. PFT indicated these figures may not be up-to-date, as some boundaries mapped by the Tasmanian Fire Service could be more than 48 hours old. Also, PFT warned that mapping from helicopters may not be accurate where smoke hides the actual fire edge. “This can result in a reduction in area at some locations in later mapping where increased visibility occurs,” PFT said in a statement. Tasmanian Minister for Resources Sarah Courtney said that it was too early to provide accurate numbers, but current estimates indicate more than 190 thousand hectares of both private and public land has been impacted. “The fire situation is still live and the contractors have been assisting the Incident Management Team in the implementation of control measures. It’s important to acknowledge the very significant contribution to the firefighting efforts of those in the timber industry, including STT staff, contractors and volunteers,” she said. The private forestry estate is a big economic contributor to the Tasmanian forestry industry. It has continued to increase in recent years, rising from 58% of forestry production in 2014-15 to 67% in 2015-16, 73% the following financial year and 74% in 2017-18, PFT’s annual report shows. At 1,104,000 ha, the private forestry estate comprises 33% of Tasmania’s reported forest area. The native forest component (841,000 ha) comprises 25% of the state’s native forests area, while the plantation estate (264,000 ha) makes up 87% of the state’s plantations. In 2017-18, the total private forest harvest rose for the sixth year in a row, rising 9% on the previous year’s record high to supply 4.25 million tonnes of logs to the market. This was the first time the private forest estate had produced more than 4 million tonnes of logs – nearly four times larger than the low of 1.1212 million tonnes in 2011-12. Plantations dominated the total, supplying 97% of the private forest harvest. Of this in 2017-18, 69% was hardwood (2.85 million tonnes) and 31% softwood (1.26 million tonnes). At 1.26 million tonnes, the private softwood harvest level is considered to be within a long-term sustainable yield range. The hardwood estate was reduced by 4000 ha last year. PFT reported that further reductions were likely as second rotations were consolidated around higher performing sites close to markets, leaving some uneconomic former MIS plantations unlikely to be replanted. “The impact of these sites is anticipated to be relatively minor if productivity improvements in second rotations can be realised,” PFT said. The impact of the fires is likely to cloud this outlook. 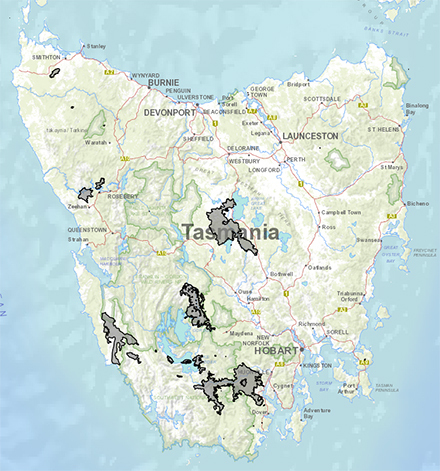 Detail of the current Tasmanian bush fires and the areas burnt can be viewed on TheLIST. FROM TFS WEBSITE. Close the pop up box and zoom to view areas affected.